Spending time with our dogs is what we all love to do. 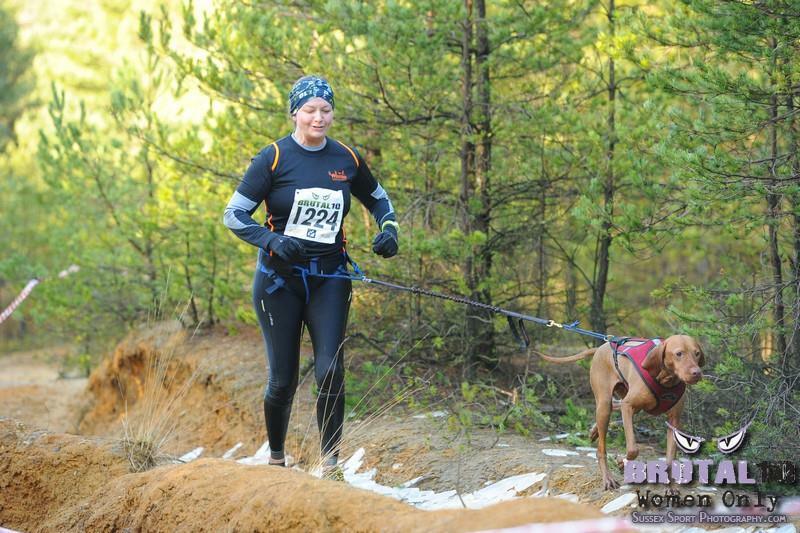 If you’re a runner or have thought about running with your Vizzie, what better way to do it than to take up Canicross together. Many people already do some form of Canicross with their dog, but probably don’t realize it! 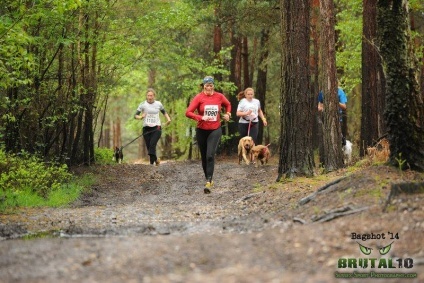 Canicross is basically cross country running, with your dog attached to you. It originally developed from the sport of Skijoring, where people ski with their dog pulling out in front of them. Running with your dog keeps you both fit and healthy and allows you to spend quality time together. Dogs are great running partners as they are reliable and always ready to run. 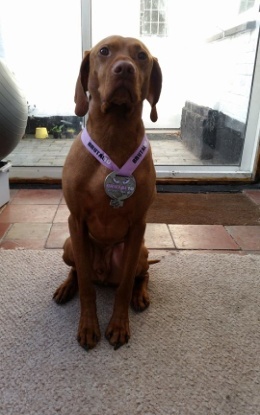 Vizsla’s are a popular choice for running dogs as Canicross stimulates mentally, as well as physically. 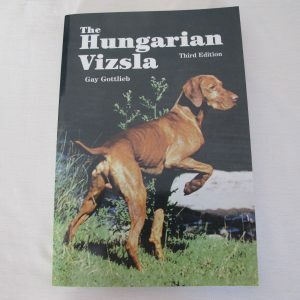 Even though our Vizslas are great running dogs, a few important things need to be considered before you start. Ensure your dog is fit and healthy, has no underlying illness and is used to some level of exercise. The key is to start slowly and build up the distance. as the Ashridge Canicrossers, based in Hertfordshire. 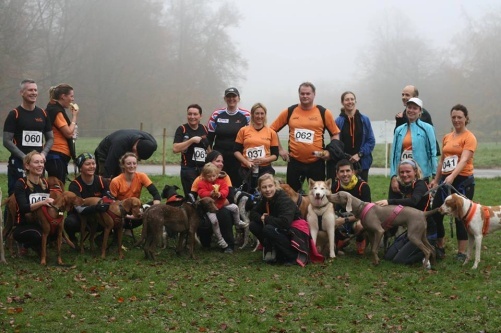 If you go to any CaniCross event, you will more than likely see at least one of our members there, just look out for black and orange! From a social perspective, not only do we run, we also have lots of evenings out and some of our members are now my best friends. The forefront of our club ethos though is the dogs and their welfare. There is such a wealth of knowledge amongst us and our dogs are always safe and happy. Vizzies are natural Canicross dogs. Some however, are better pullers than others. Harvey isn’t the greatest puller in the world (I hope he doesn’t read this!). Possibly because he’s always been taught to walk to heel and I guess I never really focused on teaching him to run out in front as much as I should have done so this is currently a work in progress. I also never thought that the dogs would be able to tell the difference between pulling and not, and that teaching them to walk to heel and then to pull on a harness would be confusing, it isn’t, they absolutely know the difference between the harness and the collar. Equally, and you will all know this, some of our Vizzies like getting muckier than others. Now, this is helpful when doing a very wet and muddy cross country race. Not so helpful if you have a diva who refuses to get wet anywhere above the claw! (Sorry Harv). If you live in or around the area, why not come and join us for a run and see if it’s for you. It has to be said that at one point, the majority of our furry club members were ginger, which was rather handy as it went well with the club orange and to be fair, I am biased! A properly fitted running belt means that the pulling weight is distributed in the lower back which is your best centre of balance and greatly reduces the chances of you being pulled flat on your face if you have a particularly strong puller! 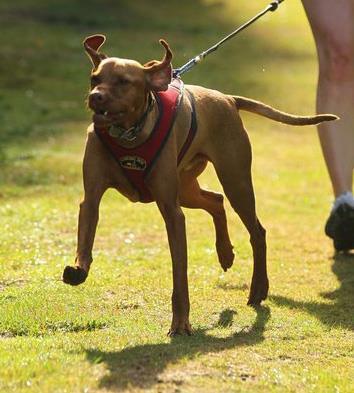 By wearing a harness designed for pulling, your dog can pull from the chest allowing strong and freer running. Never run with your dog pulling from the collar as it restricts the breathing. By introducing a harness, you are actively encouraging your dog to pull. By having different equipment, your dog will learn to associate a harness is for pulling, whereas a collar and lead is for walking to heel. A bungee line attaches the dog from his harness to your belt and includes a shock absorber, which protects you and your dog from any sudden jarring. Your Viz will probably have been trained to walk to heel, so teaching him to pull out front will be another learning experience and may take time. If you choose to run on your own initially, a good choice for your first run together is to take the dog to a fun place he’s used to visiting. You may find it beneficial to find another person who runs with their dog and you can help each other by alternating who runs out in front. Single track works better when starting out as the dog has an easy defined path to follow. Though it is best to find a local club and join in as this taps into the dogs natural instincts. The most important lesson for your dog is that running is FUN. It’s best to keep the run short for the first few trips and stop well before he gets tired. The main thing when training is to never over do it. Always observe your dog’s condition during and after training. Fitness in dogs, like humans, can take a while to achieve, so don’t try and push your dog, or yourself too far, too early. If you have more than one dog and want to run with them, run with one dog initially until you feel comfortable and your dog gets the hang of things. You will then need to go through the same process with the second dog before they can run together. There are lots of organised and competitive events and races arranged all over the UK (and the world!). Each event will have classes for all levels and distances for you to enter. I started out by volunteering to marshal at an event, however you can just go along to see what to expect. The main risk to dogs whilst they are running is over-heating and dehydration. Always take water and a bowl with you and stop to let your dog have a drink if he needs to. A dog’s pads are part of his perspiration system and how he regulates temperature. Your dog cools down by panting and sweating through the pads. If the ground is hot and air temp warm and humid, he won’t be able to cool down as effectively. Be aware of the signs of overheating in dogs and if in doubt walk and find somewhere for your dog to cool. Never run when it is hot. If you must run during the summer months, ensure you run early in the morning, or late at night when the temperature and sun are not as strong. Try to run in shaded areas, such as forests, and near to streams and rivers, so your Viz can jump in and cool off if needed. A simple guide for running is to multiply the humidity by the temperature, if it comes to over 1,000 then it’s too hot/humid.